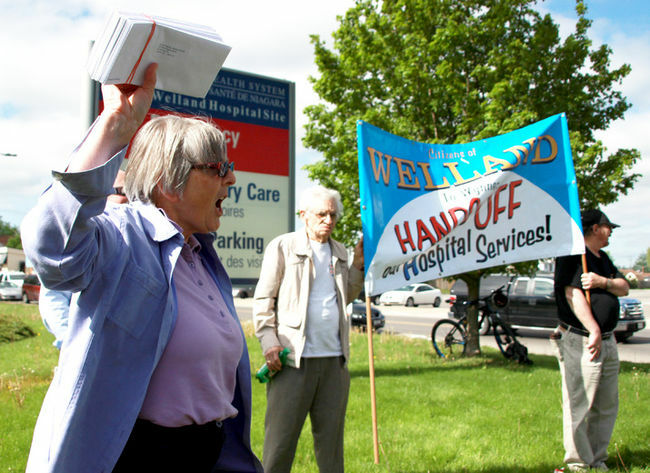 That was the main message delivered by Sue Hotte, chair of the Save Our Welland Hospital group, and other speakers gathered at a press conference held in Welland Friday morning. Their goal was to get the word out that Welland Hospital can still be saved, even as talks about the proposed south Niagara hospital progress and the province announces $9 billion in new hospital funding across Ontario. Roughly 20 people gathered by the Niagara Health System sign on the corner of King and Third Streets to show their support for keeping the Welland hospital open and fully functional. Speakers said their motive isn’t to stop the upcoming south Niagara hospital in Niagara Falls, but to emphasize that each of the hospitals are needed to properly serve Niagara’s communities. “My dream has always been to have a centre of excellence in the centre of the population,” said Welland resident and Save Our Hospital member Henry Miron. He went on to talk about how both he and his wife have used the hospital in times of need. Miron also spoke about the “ballooning” population, a matter which was also on Welland Mayor Frank Campion’s mind. He called Welland’s hospital a necessity and said his growing community is going to change a lot in the coming years. He said in 20 years it will be completely different in terms of population, so keeping the hospital around for Welland residents of the future is important to him. Those present were also skeptical about the geographical location of the proposed new hospital. “The hospital being proposed is not a south Niagara hospital,” he said, adding that people, including Niagara Falls Mayor Jim Diodati, should stop calling it that. Hotte said the Welland hospital serves 100,000 people, and if it’s taken away, those people will be forced to contend with the distance of going to the proposed location on the corner of Montrose and Biggar Roads in Niagara Falls. Although the estimate being given is that it takes roughly 15 minutes to get from Welland to the proposed location, Hotte challenged that number, saying different times of the day and traffic volume are not being taken into consideration. Wainfleet Mayor April Jeffs noted that having a hospital in Welland and an urgent care centre in Port Colborne are critical to her residents who would have an even farther distance to travel if those centres were closed or their services reduced. She said it’s necessary to have “equitable, fair access” to health care services for everyone. Both Hotte and Welland NDP MPP Cindy Forster agree the new hospital seems to be about one thing. “It all boils down to ‘the buck,’” Forster said. She went on to say that communities should not be cutting beds and closing hospital doors, but increasing the beds available. Hotte said the value of a human life is worth much more than what the Niagara Health System is trying to save. She came to the press conference armed with boxes containing a total of 2,500 letters from those who want to see the hospital stay as is. “One call, one letter, one email means a lot of people behind that. A lot of people are thinking the same way,” Hotte said of the impact she sees the petitions making. The letters are to be handed off to Forster, who will take them to Queen’s Park to demonstrate the community’s resolve in keeping the hospital around. The Niagara Health Coalition is also headed to Queen’s Park for the day of action at the Ontario Legislature on May 31. A flier handed out at the Friday-morning press conference noted the group will be there to support the letters being handed over to Ontario Premier Kathleen Wynne. Hotte said people can get in touch to find out more information by calling her at 905-932-1646 or by emailing niagarahealthcoalition@yahoo.ca. NHS president Suzanne Johnston issued a statement in regards to concerns about the hospital. She said she and Campion have had “excellent dialogue” and his advocacy and concern for the healthcare of his city’s residents is something she appreciates. Moving forward, she wrote the NHS acknowledges the importance of a 24-hour emergency service and other services in Welland and will continue to explore the different options available for those needs. Her statement said the NHS is seeking to find the best quality care for its patients and their families while maintaining a sustainable system. More information about plans for the Welland site are available at niagarahealth.on.ca/site/future/welland-ambulatory-care-urgent-care-centre.